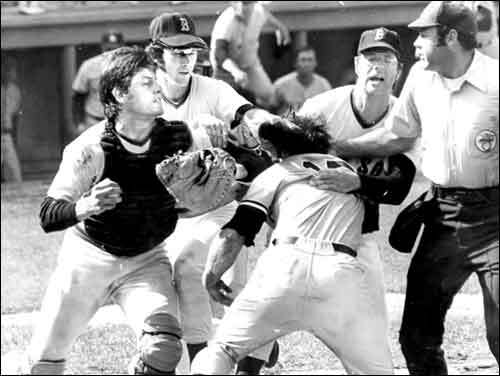 Carlton Fisk, left, and Red Sox teammates mix it up with Yankees Thurman Munson. Chances are if you’re an avid Red Sox fan, then you probably know a lot about the Yankees. The same can be said in reverse if you’re a Yankees fan. No matter which side of the fence you land on, it’s a fair assumption to say you know where the other team stands, what their weakness is, what their strengths are and what unknowns they have. You really couldn’t call yourself a Yankees fan or a Red Sox fan if you didn’t have a pretty good grasp on how the other team stacked up. That’s one of the reasons why I laugh when I hear people outside of the Sox-Yankees box ask: “Is that rivalry still what it once was?” The simple answer to that question is, YES. It’s still very much alive, but it may be in a sort of hibernation. Not because the animosity no longer exists between the fan bases…..trust me, it does. No, the reason for that is because the Red Sox and the Yankees haven’t gone head to head in games that determine the post season fate for each other. Nor have they actually played each other in the post season for quite some time (I shouldn’t need to remind anyone when that last post season game was played between the two). If there has been any tempering of the rivalry (and I’m not sure if this even applies to the majority), then it’s possible that the fans of each team may have developed a certain type of tolerance for one another in the past 10 years or so. Meaning that in some cases, they can actually talk to one another from time to time about baseball without getting into a fist fight. Does that sound extreme to you? It shouldn’t, because at the very far end of the “Those people are nuts!” scale, there have been reported incidents of *assault with a deadly weapon and yes, even **murder attributed to this rivalry. These are obviously extreme cases, but they underscore the levels of dislike some of these fans have for each other. Also absent from this rivalry (and this is no small factor) is the real dislike the players once had for each other. Just say the names Munson and Fisk together and any Red Sox or Yankees fan will know exactly what you’re talking about. It hasn’t always been the case, but there certainly was from time to time real player dislike for one another. That only helped pour fuel on the fire for the fans. That kind of dislike on the field hasn’t gone on in a while. The closest you may come to it would be how Joba Chamberlain and Kevin Youkilis once felt about each other. Youkilis, now getting ready to play a season in New York…..for the Yankees…..should tell you all you need to know about how heated that hatred was (not a huge thing). But ask any Sox fan or Yankees fan if they ever thought it possible that Fisk would play in New York or if Munson would ever play in Boston. The answer you’ll get will be a resounding “NO F-IN WAY!! THOSE GUYS HATED THAT TEAM”……and they would be right. Today while we sit in the stands prior to any Sox-Yankee game, we see players from each team cross that invisible line and go chat it up with a member of the opposing team. It’s not unusual and it’s more common place then it ever was. But if you asked any Red Sox fan: Would you rather see Dustin Pedroia walk over and shake hands with Mark Teixeira or would you rather see him punch Mark in the mouth? Take a guess what answer you would get. Turn the question around and ask it of any Yankees fan and you’ll get the same answer. “Punch him in the mouth” would win by a landslide. It’s safe to say most of these fans would rather the players not like each other so much. In fact, I think the fans would love it if the players felt the same way about the opposing team and its players as they did. While many people around the country may view baseball as one of the more “High Brow” sports in America, the regions around New York and Boston would probably prefer less “High Brow” and more “Let’s Get It On” when they play each other. Why? Because this rivalry my friends is far from dead. These teams fans love to hate each other. They’re just taking a nap right now and biding their time for another Fisk-Munson or another post season match up. Trust me, when either of those things happen (and one certainly will), the people outside looking in on this thing labeled as the greatest rivalry in all sports won’t be asking if it still exists. Instead, they’ll be tuning in to watch the best baseball has to offer. The Boston Red Sox vs The New York Yankees. There is nothing else like it…….and that’s a good thing. From a starting rotation in 2011 that mainly consisted of Beckett, Lester, Lackey, Wakefield, Buchholz & Miller through much of the season, do you know how many times a Boston pitcher went 7+ innings in a game? I’ll lay it out for you starting with Beckett. There it is. Out of the 138 games started, 847IP, these 6 guys were able to complete or get past the 7th inning 41 times. Matsuzaka – 12 starts, 59.1IP, went at least 7 innings 1 time. Out of the 137 games started, 828.1IP, these 6 guys were only able to complete or get past the 7th inning 40 times. The similarities are striking. Just to jog your memory, the 2009 starting rotation wasn’t considered very good either. In fact, the pitching staff as a whole posted a 4.35era and a 1.409whip. Compare that to the 2011 staff which posted a 4.20era and a 1.308whip and you could argue that 2009 was worse than 2011. I shouldn’t have to remind you that 2009 was a disappointing year. The difference between that year and this year is we were swept in the 2009ALDS. In 2011 we were one game away from making it to the playoffs at all. So, maybe someone is thinking it wasn’t the pitching that let us down at all? You and I both know that would be incorrect. It was the pitching in both season’s that let this team down and I shouldn’t have to lay it out month to month for you to know when that occurred. In each case, the pitching dropped off in the 2nd half of the season. Pitchers going deep into games happened much more frequently in the 1st half compared to the 2nd half of each of those seasons. “So what? That seems normal.” you might say, well stop and think about what that does to the bullpen for one thing. And no, there is nothing normal about a winning team who’s rotation is less dependable in the 2nd half compared to the 1st half of a season, In fact, you could say that winning teams have a combination of pitchers who are just as, or at least close to being as dependable in September as they were in April. We haven’t seen that in a while. Sure injuries and fatigue are factors on an individual basis, but what the team has to call up or bring in to make up for those guys is the difference maker. Think back. In 2007 the Red Sox had a guy named Jon Lester to call up in the 2nd half to take the place of an injured Curt Shilling and an inconsistent Julian Tavarez. Granted, Lester wasn’t exactly lights out posting a 4.57era and a 1.460whip, but who did we have this year to replace Clay Buchholz and injuries to Beckett in the 2nd half? The answer is a combination of Andrew Miller and Kyle Weiland. Combined, they posted and ERA north of 6.50 and a whip above 1.700. In 2007 Lester threw 63IP. In 2011 Miller/Weiland were needed to throw 89IP. That adds up to more work for less talented players. Not exactly a winning formula. Just to keep the comparing years consistent here, the 2nd half pitcher in 2009 the Sox counted on to take the place of an injured Matsuzaka was a kid named Buchholz. Clay made 16 starts and threw 92 innings during the 2nd half of that season posting a 4.21era and a 1.380whip. A look at the teams win pct when these guys took the mound might put things in a clearer perspective. While neither Lester in 2007 nor Buchholz in 2009 were Ace material yet, they both proved to be more helpful than the Miller/Weiland combo we endured this past season. So, while injuries and fatigue can and do set into starting rotations by the 2nd half, who the team has to call upon is crucial to making a run down the stretch. In 2011, we didn’t have that kind of talent to call upon and that my friends is on the General Manager not the guy who had to pencil those names on a lineup card. Issues in the clubhouse, out of shape players and malcontents, while certainly a problem were not the downfall of the 2011 Red Sox. We didn’t have the September we just witnessed because people were in a bad mood. No, we had that September because we had bad pitching…period, exclamation point and end of story. We have to have improved options in 2012 if we hope to do better than a 3rd place finish…again. Football is OVAH and now all eyes in New England will turn to the Sawx. So, how does this version of the Old Town Team stand up? You’re sure to hear two schools of thought on this….maybe even a third, but for the sake of addressing the extremes (which is pretty much the nature of things surrounding this team), let’s take a look at the positive point of view and then counter that with an equal amount of negativism just to keep things *balanced. their contracts. Our starting pitching can’t be touched in the AL East. Lester, Buchholz, Beckett, Lackey and Matsuzaka have to be considered the rotation to beat in this division. Our starting pitching is 8 men deep with Wakefield, Doubront and Bowden ready to go if needed. We have positional depth just in case one of the regular guys gets hurt. We’re not talking about warm bodies that can just fill in, we’re talking about guys that can not only fill in, but also perform at a high level. Our outfield depth consists of Cameron, McDonald and even Ryan Kalish who’s expected to be getting ready in Pawtucket next season. We have the infield covered with Jed Lowrie and a veteran backup catcher with Jason Varitek. The pessimist says, “Pedroia say’s his foot is still giving him issues. Ellsbury has to be rusty having not really played in almost a year….let alone the questions about if he’s tough enough to play the whole year. Youkilis is moving across the diamond to a postion he hasn’t played on a regular basis since 2009. Jarrod Saltalamacchia has yet to have a full season in the majors. Heck, last year he had problems throwing the ball back to the pitcher never mind throwing anyone out at second base and he’s our starting catcher? What if he doesn’t cut it? Are we going to have to rely on Varitek’s bat to produce? Geez, Adrian Gonzalez is coming off shoulder surgery and even JD Drew has already started to complain that his hamstring is still giving him problems. Our Pitching? Don’t even get me started. Outside of Lester, who do we really have that we can count on? Sure, Buccholz had a fine season last year. Do you really think he’s going to be able to repeat that again this year and go a full season with an ERA under 3.00? What about Beckett? He had a horrible season last year as did John Lackey for what we’re paying them. Matsuzaka?……Please. I’m willing to bet I’ll be able to count the number of games he makes it to the 7th inning on one hand this year. While I do like some of the guys we picked up for the bullpen, if anyone thinks that what we have out there compares to what the Yankees have, you’re nuts! So, who’s right and who’s wrong? Suffice it to say, there are definitely things to be encouraged about. There is also an number of things that should give you some pause before you crown this years team the winners of anything. The humorous aspect to this whole debate is that this year really isn’t any different than recent years past. There are questions that need to be answered and there are any number of things you can feel safe with when it comes to expectations. But this year, just like years past…..the Red Sox have to play the games. All 162 of them. If you’re looking for one thing that you can be assured of it’s this……The team that starts on opening day will look different from the one you’ll see in September. Just keep your fingers crossed that it doesn’t look TOO different. If we can make it all the way to October with the majority of the team intact, that will mean our guys have remained healthy. Don’t let anyone fool you because if there is one very important key to success, that one would be the most basic. If you’ve been keeping up with anything to do with the Red Sox recently in the press, then you know that this thought is out there. “Will the Red Sox look to trade Papelbon by mid-season?” is the question being asked. The argument….or rather….the thought is that the Red Sox will not offer him arbitration at season’s end because Paps might accept that offer which would put the Sox on the hook for a salary north of the $12.5 million he’s going to make this year. By not offering Papelbon arbitration, the Sox would effectively be letting him walk without getting anything in return (otherwise known as draft picks). So, the idea has been floated that the Sox might look to trade him before the deadline which would net them some sort of return. Here are the problems with that in my humble opinion. Problem #1: Papelbon’s 2011 salary is a hefty one for a closer. In order for the Sox to trade him and not have to eat any of that salary, Papelbon is going to have to perform like the Papelbon of old and appear to be worth that kind of cash commitment. Here’s the issue with that…..If Paps indeed is pitching up to that value, then why on earth would the Sox look to weaken the Bullpen by trading an elite closer? It makes zero sense. The Bullpen was a major sore spot for the Sox last season. It’s hard to believe that Theo Epstein would be lookiing to trade away an important part of the 2011 season solely for the hope of getting some sort of return. Problem #2: If Papelbon isn’t performing, what team in their right mind is going to pick up that salary and also give the Sox a player or two for his services? Again, this doesn’t make sense. If Papelbon isn’t performing up to the level of an elite closer, then what’s his value going to be considering his salary? Call me crazy, but unless there is some team out there at the time that is extremely desperate, I don’t see a lot of interest in a $12 million closer that isn’t cutting it. Let’s face it, if his 2010 struggles continue, then the Sox will simply replace him with either Jenks or Bard and use Paps in the 8th inning. That’s a worst case scenario. The more likely outcome of the upcoming season is that Paps will indeed have a bounce back year. If that’s the case, then he isn’t going anywhere. Bottom line, like it or not, I think you can expect Papelbon to be with the Red Sox for the entire 2011 season.